"Fantastic product, good as gold - we use it for everything!" "Great cleaner for alloy wheels, also excellent on cloth and leather car seats. It does not contain silicones, great for degreasing any part of a vehicle! 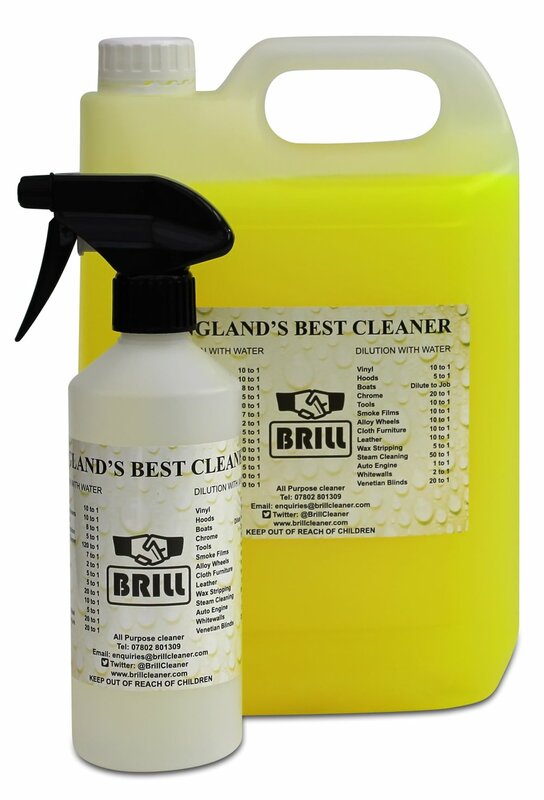 We would highly recommend brill cleaner to other businesses"
"Brill is a fantastic cleaner in the kitchen for grease; especially for cleaning stainless steel canapes. We basically use the product on everything that needs cleaning. We would definitely recommend Brill Cleaner to any business or household"
"Truly the best value cleaner that i've ever seen in 30 years of trading, I use it for wood, PVCu, car, alloy wheels and my jacket to get oil and heavy dirt off. I can't praise it enough. I even use it when the dog has been to the toilet on the carpet- brings everything up lovely. Also lovely people to deal with"! "We have been using the brill cleaner for a lot of years and find the product very good. I don’t plan on changing the product as it is very effective for both our general and commercial cleaning, our factory has a lot of oil surrounding our machinery and it work faster than anything we have tried in the past, we also find the service very friendly and would be happy to recommend you.Thanks for your help over the years". "First class product that i would highly recommend. Excellent for the floor, we use it to break grease down on the floor, walls and tables. We use it with hot water and scrub in to the floor, our floor is white and take alot of wear and tear- there is nothing to touch Brill Cleaner"!